How Do Lemurs Move Around? 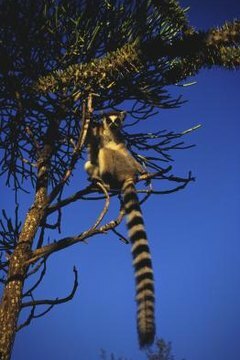 Lemurs find all kinds of way to move around Madagascar, their island nation home. As some of the oldest living species of primates, lemurs evolved in isolation from other primate species during the African island’s 160 million years of isolation. Lemurs adapted to make the most of their habitat, navigating the unique landscape with grace and agility. These fascinating creatures attract researchers and tourists alike to the Big Red Island. The arboreal indri and sifaka lemurs impress observers with their uniquely adapted leaping ability. These bipedal primates can leap across distances of more than 30 feet as they move from tree to tree in the forest canopy. They move feet first, body upright, unless monkeys who leap leading with their hands. The quadruped ruffed lemur, in contrast, clings to a tree and looks over its shoulder as it pushes off, leaping to the next tree behind it. The animal spins in mid-air so it can grab and hold on to the new tree facing forwards. Because sifakas have evolved to move upright through the trees, they cannot walk on all fours as some lemurs and other primates do. The trees in their habitat from which they forage for food are so widely dispersed that, even with their impressive leaping ability, they also must take to the ground. They sashay across the ground with their forearms raised, and their balanced gait recalls a ballet dancer's grace. Sifakas also travel by leaping across the land, much as they would leap from branch to branch in the trees, their forearms free to use for balance. The sifaka lemur travels frequently in search of food, and mothers would suffer if their movement was restricted to a single nesting site. These lemurs adapted to accommodate this by bringing their young along with them as they leap from tree to tree. Newborns ride clinging to their mothers' bellies until they are about 3 months old. For the next three or four months of its life, the baby hitches a ride on its mother's back, learning which of the more than 100 types of vegetation growing in its habitat are good to eat. Ring-tailed lemurs are unique even among other lemurs for their quadrupedal locomotion and their comfort on the ground, where they spend more time than any other lemur species. At the Berenty Reserve in the far south of Madagascar, ring-tails patrol the grounds in troops and are known to steal food from people if they left it lying about. At Lemur Island, a privately owned island reserve near Andasibe in central Madagascar, semi-tame brown lemurs accost tourists, jumping on their shoulders and performing tricks in hopes they will be rewarded with treats.